Rosa is the author of both fiction and non-fiction books (as Rosa Arcade). She has written and co-authored over twenty publications and scripts, as well as 200+ articles for online publications. Rosa is the creator of the animated series, Zomb-Eh? and artist/writer for Eeyayho’s Adventure. A trained and award winning actress, she has also earned critical praise for writing, art, singing, and public speaking. An active member of her community, Rosa works with non-profit organizations to provide educational and health programs. 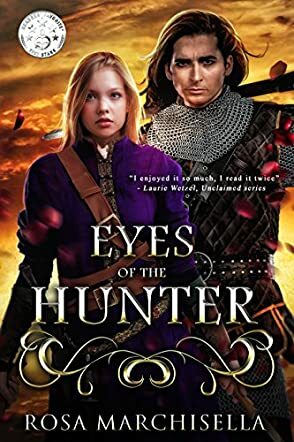 Eyes of the Hunter by Rosa Marchisella is a fantastic young adult adventure tale about a young prince who may not be all that he seems. After years of giving birth to girls and no heir to the throne of Simanthea, finally the queen produces a boy to claim the throne. Prince Erin is special, not only because he is a boy and able to rule when his father, the king dies, but also in ways that will surprise. An overprotective queen chooses a young lad, Caley, to be Prince Erin's friend, companion, and bodyguard to ensure the prince's safety. As Erin grows he quickly realises something is wrong and ultimately he must run to escape the clutches of the king, as well as his now furious friend, Caley, who feels angry and betrayed by the lies and deceit of the queen and Prince Erin. What follows is a chase across many lands by Caley - who is now known as The Hunter - to seek Prince Erin and destroy the boy who ruined his life. This is a wonderful story with a fascinating premise that had me hooked from the very beginning. Eyes of the Hunter is a very suitable story for young adults as it explores the aspects of relationships and how they can be affected by lies and deceit. Rosa Marchisella did a tremendous job with the two main characters, Prince Erin and Caley, in developing the relationship between the pair and showing how love and hate can be two sides of the same coin. The action is fast and frenetic with plenty of little twists thrown into the story to keep the reader guessing. I found the writing to be tight and compelling, drawing the reader into the story and ensuring he/she just wanted to keep reading. This story could well be the basis for a series of books and I, for one, would love to read more about these two characters. The author definitely set the scene for a possible sequel, which is great. An excellent read that is as equally suitable for adults as it is for young adults. A great job by Ms Marchisella.